I went through all the fonts in notepad ++, scrolling, although most of it shows all the characters … but it’s not that perfect, only “consolas” is perfect in style, although it does not display all the characters like a simple windows notepad. https://i.imgur.com/EFj8ydc.png I can not understand how “consolas” in a windows notepad, recognizes symbols, whereas notepad ++ can not. So a windows notepad uses several fonts at once? these files are not present, GlobalUserInterface.CompositeFont, GlobalMonospace.CompositeFont. But they are in other sections through the search. What I would like to add is that some of the fonts are suitable for covering all the characters. But their style is different, and it’s hard to get used to another style. As pretty much exclusively an “A to Z” person (what, there’s more than that? :-D)…the issue discussed in this thread seems to come up quite often. From my limited perspective, this thread seems to explain things pretty well. So…why not make a “FAQ Desk” entry out of it and we can just forget about it–meaning it is a solved thing? The general complaint always seems to be “Notepad.exe can display my characters, why can’t Notepad++?”. To me, @PeterJones 's post explained that–I had no idea. Peter (and Guy) seem to have the best grasp on the concepts here, so I would hope one of them (or a collaboration) could do a “FAQ Desk”. Only few fonts support those symbols. From the default pre-installed fonts the best would be “Segoe UI Symbol”. Some others: SimSun, MS Gothic. In MS Notepad all fonts work because it has font fallback system (as others already explained). In Notepad++ it does not work. Thanks, it is necessary to reconcile to this difference -_-. Hello everyone. I just tested some symbol characters in notepad++ and indeed, notepad++ doesn’t seem to have some kind of a font fallback feature when a font can not display some of the characters. Also, in some other word processors, (and maybe also text editors?) 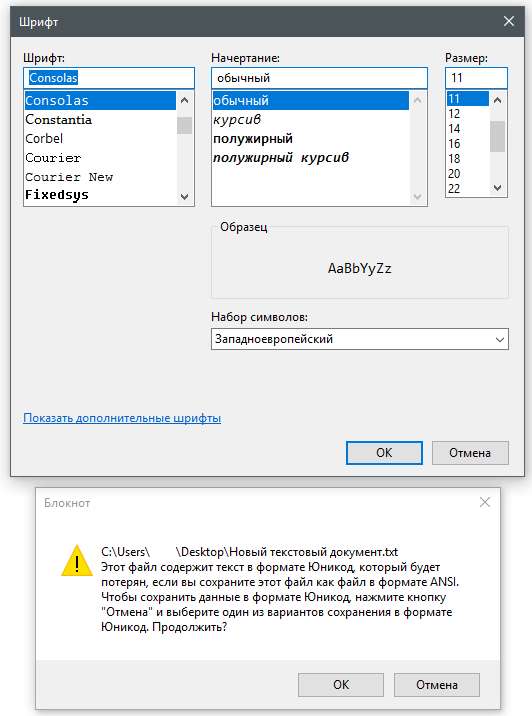 you can choose to use different fonts in the same file, which we can not do in notepad++. Notepad++ just forces you to use a single font everywhere at all times :( except for example you can set a different font for the line numbers but otherwise, can not change the font for individual characters. Does anyone know how we can at least make different characters use different fonts in notepad++? if we can do that, that would solve our problem. Well, you can solve this problem if you put a supporting symbol in front, like. Here are the symbols for the test, but this is not an option;), and at the same time it is difficult to wean from the “consolas”. Notepad++ is not a word processor - it is a very advanced text editor. MS Office Word are totally different. npp got a second application area - easy data manipulation tool. is to use npp as a replacement for a word processor. hasn’t been designed for such purpose either. otherwise you chose the wrong tool for the work to be done. Hmm. What you say makes sense. I use libre office for my linguistics work. But, I also like to mix programming with linguistics and that’s where notepad++ comes in. It just would be good to be able to display more characters from within notepad++ and that requires the use of different fonts. That’s all. Using different fonts in the current document is possible but I guess not in the way you want it to have. High level description about how scintilla is working. Scintilla uses lexers to tokenize the current document and to assign different styles to those tokens. A lexer is basically code which scans the document based upon predefined and hardcoded rules. Token is the text/string which results if a rule could be applied. Styles are the definition how such Tokens should be displayed like which font name, size, style etc… should be applied. So, a comment style can have a different font than, let’s say, a keyword. But the lexer has to know beforehand the rule to identify this part of the text. but there is a 1:1 relation - one token, one style. d) possibly other things I’m currently not thinking about. Hope this clarifies it a little bit more. I found one program “RJ TextEd”, opens “Consolas + unicode” as notepad.exe.